Just days before on February 13, 2018, United Airlines Flight 1175 bound for Honolulu from San Francisco experienced sudden shaking after the cowling, or outer casing, of one of the engines ripped off mid-flight. Passengers heard a loud boom followed by a whining sound and the entire plane shaking. For approximately the next hour, passengers watched in horror as pieces of the cowling continued to rip off of the engine and fall into the ocean below. Some passengers filmed the exposed engine and the violent shaking inside the cabin. Oxygen masks hung from the ceiling and crew members instructed passengers to brace for landing. The 363 passengers on board were relieved when the aircraft finally landed. Wisner Law Firm has been contacted by passengers seeking representation in pursuing claims as a result of this incident and filing a lawsuit in Cook County, Illinois. Both Boeing and United Airlines are headquartered in Chicago, Illinois. 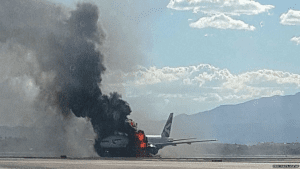 Wisner Law Firm represented over 100 passengers and crew of British Air Flight 2276 in obtaining compensation for them for their physical and psychological injuries resulting from an engine fire on that Boeing aircraft at McCarron International airport in Las Vegas. Wisner Law Firm presently is representing nearly 50 passengers of American Airlines Flight 383 who suffered similar injuries in another engine fire at Chicago’s O’Hare International airport on October 28, 2016. Wisner Law Firm has obtained favorable compensation for over half of those clients.